My friends Tim and Mary invited me to prepare dinner for Tim’s business friends. Since it was a working week night, we selected dishes that could be served in about 2 hours. Mary prepared Thai Chicken Barbeque for appetizers, Cream of Asparagus Soup for the starting course, and Creme Brulee for dessert. I prepared the main courses which consisted of: Pan-Seared Steaks with a Mustard Sauce, Pan-Seared Scallops and Prawns with a Spinach, Arugula and Orange Salad, Fingerling Potatoes With Aioli, and Carrots and Parsnips Braised in Butter. Wild-caught salmon fillets are coated with coriander seeds, roasted in a pan for a few minutes, and served with a delicate, tangy white wine-orange sauce. 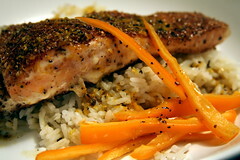 Here is the Pan-Roasted Salmon recipe. 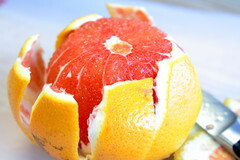 Today, I visited an overseas friend who taught me some of her native dishes. 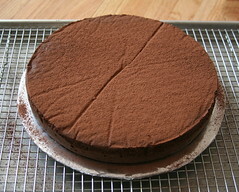 To celebrate her arrival to our town, I baked her The Ultimate Flourless Chocolate Cake, which has only 3 mandatory ingredients: chocolate, butter, and eggs, and an optional one: coffee liqueur, which I obliged. 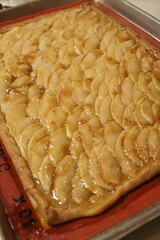 Here is Apple Galette, a pastry treat for the holidays. 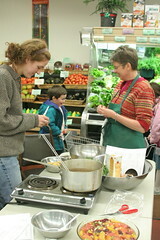 Here is Cream of Potato Soup, a comfort food for the cold Minnesota winter, from MFK Fischer, a comforting food writer. Today, we prepared two lentil dishes — Lentil Sausage Soup with red lentils and French Lentils With Bacon and Vegetables with green lentils (lentilles du Puy). 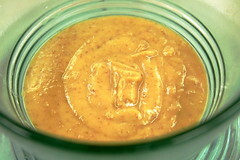 We started the soup by soaking red lentils in boiling water. Then we sautéed onions, garlic, cumin seeds, fresh thyme, celery and carrots in olive oil. Then, we drained the lentils, added it together with chicken stock and tomato paste to the sautéed vegetables. Finally, we added turkey kielbasa, red wine vinegar, sour cream and a generous amount of Parmigiano Reggiano (parmesan cheese). Here is the Lentil Sausage Soup recipe. We started the French lentil dish by gently boiling the lentils only until they were cooked but still firm and retaining their form. In another pan, we cooked bacon only until they were cooked, still limp and slightly browned. We removed the cooked bacon, added olive oil and sautéed onions, garlic, summer squash, Chinese broccoli, Swiss chard, fresh cayenne pepper, and kohlrabi green tops. Then we added the cooked lentils and bacon and seasoned the dish with salt, pepper, and lemon juice. Here is the French Lentils With Bacon and Vegetables recipe. Here is a French Lentils With Summer Vegetables recipe that substitutes the bacon with tomatoes and an additional fresh cayenne pepper. To celebrate the holiday season, we prepared a comforting chestnut soup and a festive fruit salad. 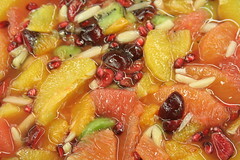 …and combined them with cherries, kiwi, pomegranate seeds, and slivered almonds into a colorful fruit salad. … and prepared a hearty chestnut soup.Here is the recipe.